Former UConn players (l. to r.) Donny Marshall, Kevin Ollie and Ray Allen. 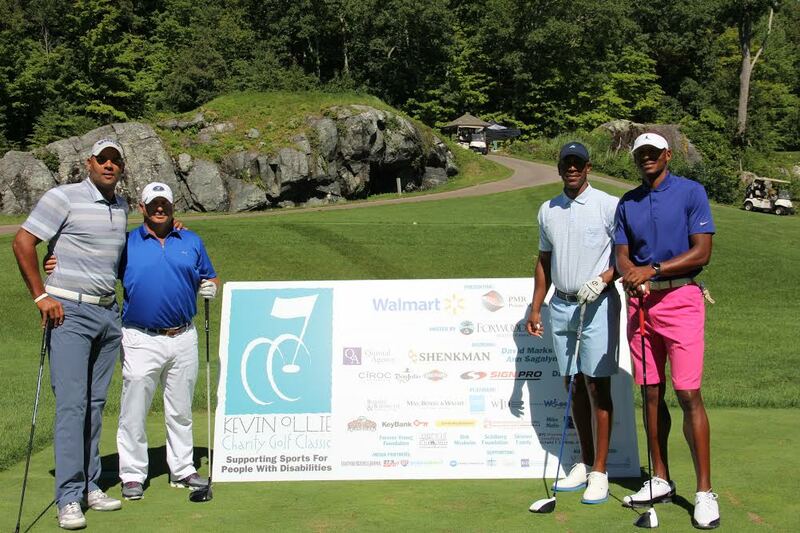 The 2016 Kevin Ollie Charity Golf Classic presented by Walmart and PMR/Prime Materials Recovery, Inc. broke records and smiles on and off the course. This is the 15th year of Kevin Ollie's involvement in the Tournament and with the $170,000 raised this year the Tournament has now donated more than $1 million to help support people with disabilities through sports. For the first time, Foxwoods Resort Casino and Lake of Isles in North Stonington hosted the event. "Our goal is help give every child a shot," Coach Ollie said. But the event was not about playing golf—because every child deserves a shot. For thirty years, Tournament proceeds have underwritten many programs and athletic events for athletes with disabilities on the world stage and weekend warriors, including Paralympic Gold Medalist Paul Nitz, Ivan Lendl’s Wheelchair Tennis Camp, Connecticut Sled Hockey, and The Miracle Field in West Hartford. Ollie is now building Kevin's Kourts, inclusive basketball courts throughout Connecticut. Coach Ollie announced that he anticipates breaking ground this Fall in Waterbury on the second "Kevin's Kourt", with a previously announced grant from the Connecticut Housing Finance Authority (CHFA). Coach Ollie was joined by NBA star Ray Allen, Southern Connecticut State University Men's Basketball Head Basketball Coach Scott Burrell, TV Basketball Analyst Donny Marshall, NFL Legend Sterling Sharpe and UConn team mates and other former players. Earlier in the weekend Coach Kevin Ollie and his UConn Coaching Staff hosted a clinic for 80 area Tribal youth at the Mashantucket Pequot Tribal Nation Community Center. The Kevin Ollie Charity Classic also announced its annual 2016 Schamback Award Winner, Paige McCullouch-Casciano, a recreational therapist at Mount Sinai Rehabilitation Hospital who co-founded an adaptive rowing program in Hartford; and 2016 George McLaughlin Award Winner, 17 year old David Gelfand. Although born with Proximal Focal Femoral Defiency, missing the bones between his hip and foot on his left side, David captains the Weston High School swim team.